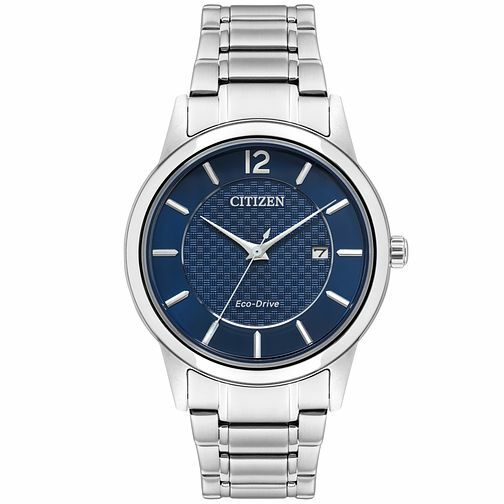 Featuring innovative Eco-Drive technology, this stylish men's watch from Citizen is a perfect balance of style and function. Featuring a stylish blue chronograph dial complete with date box, this sleek watch is finished with a stainless steel bracelet strap. Distinctive design for everyday timekeeping. Citizen Eco-Drive Men's Stainless Steel Blue Dial Watch is rated 4.5 out of 5 by 4. Rated 5 out of 5 by Anonymous from Watch Excellent watch and keeps accurate time and comfortable to wear. Rated 4 out of 5 by Anonymous from A good looking watch which, so far, appears to be a good time keeper I needed a watch which I could see clearly as I am visually impaired. the bracelet is comfortable any easy to take on and off. I also wanted something that is reliable , requiring minimal maintenance; The solar powered battery should provide me with this. I would have f preferred it to be water resistant.